Author and librarian Gilles Poitras will be at FanimeCon to share his vast knowledge of anime, manga, and related fan culture. 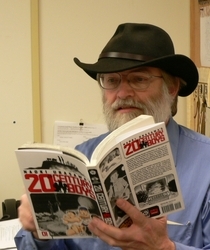 His extensive resume displays a large body of work, from author of many popular books, such as The Anime Companion, Anime Essentials, and the Anime Companion 2, to contributor to magazines, including Newtype USA and Otaku USA. Mr. Poitras is also the "Access Services Librarian" at Golden Gate University in San Francisco, and serves as a senior board member of Mechademia, an annual scholarly anthology of essays on anime, manga and fan culture. He has also given all-day workshops for librarians, introduced anime films at the Smithsonian, and even taught a course on the subject of anime for Pixar staff.